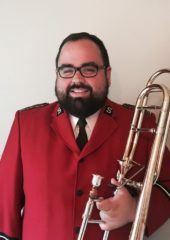 The Canadian Staff Band (Bandmaster John Lam) has appointed Brendan Hill of Yorkminster Citadel to the trombone section. Hill is a fourth-generation Salvationist who grew up in Oshawa, attending Oshawa Temple as a child. In 2012, he and his family began attending Yorkminster Citadel, where he is now a member of the Yorkminster Citadel Band and Songsters. In 2014, Hill was appointed Youth Bandmaster, and has most recently taken on the role of Young People’s Sergeant Major. He is also a member of the OCE Divisional Youth Band. In his professional life, Hill works as an Educational Assistant with the Durham District School Board. His background and education is in youth work and developmental disabilities. Hill’s greatest musical influence and his first teacher was his father, Roland Hill, who was the bandmaster of the Whitby Brass Band for over 30 years. Brendan Hill played with the Whitby Brass Band for 14 years, including 8 years as principal trombone and soloist. Hill has also had the privilege of performing with such groups as the Guelph Symphony, Kitchener-Waterloo Youth Orchestra, Hannaford Youth Band, the Toronto Youth Wind Orchestra, and Weston Silver Band. Some of his musical highlights so far include performing at Carnegie Hall with the Toronto Youth Wind Orchestra and touring British Columbia with the National Youth Band of Canada. He is also a founding member of the award-winning Kingston Brass, a Toronto-based brass ensemble. Throughout my entire life, music has played such a critical and life-changing role in my walk with the Lord. Music ministries holds a very special place in my heart, and I am so thankful for the great influences who have challenged me to grow, and who have supported me on this journey. From a young age, the Canadian Staff Band has been a massive influence on me both musically and spiritually, and I can’t wait for the opportunity to share in this truly special and unique ministry. This article was posted in News and tagged appointment, Brendan Hill, Canadian Staff Band, John Lam, personnel, Roland Hill, trombone on 5 October 2017 .